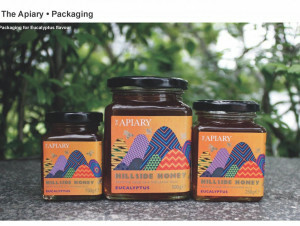 The Apiary is a social enterprise committed to alleviating poverty for Rwandan beekeepers and their communities. The Apiary’s team of experts is committed to equipping beekeepers with knowledge and hive management skills, in order to ensure the sustained development of Rwanda’s tradition of apiculture whilst achieving stable incomes from honey harvests for the beekeepers. The brand’s objective is to enable wellness through sustainable practices. Globally, the honey also plays an ambassadorial role in positioning Rwanda as a source of high quality natural produce. 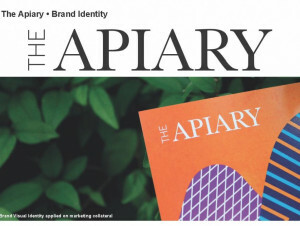 The Apiary brand name was selected for its association with the beekeeping tradition. It is definitive yet retains a premium sensibility with “The” as a prefix. The brand identity is rendered simply in uppercase type and takes the visual form of a rectangle or box. An extensive exploration of images and motifs of bees, florals, Rwandan / African culture and the land- scape was conducted to craft a secondary graphics system that would capture these aspects of the product’s origins. The strong graphic lines and contrasting colours of traditional African arts and crafts were applied to images of flowers, bees, honeycombs and Rwanda’s rolling hills. 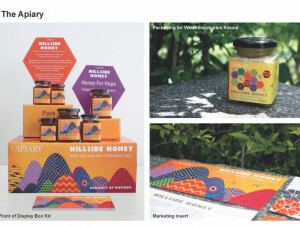 These form the basis for a striking brand visual identity, and have been applied onto The Apiary’s marketing collateral, packaging and point-of-sale units.